If you’ve ever tried to make pizza at home using fresh tomatoes or zucchini as a topping, you know that vegetables like this erupt liquid as they cook, which can lead to soggy pizza, loss of topping adhesion, and ultimately, antidepressant abuse. Before you let wet vegetables push you over the edge, consider this useful technique that can help you drive some of the moisture from the more water-laden staples. For our recent grilled pizza adventure, one of the toppings I used was sliced, raw plum tomatoes. Tomatoes are loaded with liquid, and to put raw tomatoes over a hot grill on a nice, crisp pizza crust could spell disaster, or at least a joy-impaired pizza-eating experience. To avoid such a bleak end, I used the following technique to help purge moisture from the tomatoes before slapping them on the pizza. One of the big sources of moisture in tomatoes is the seeds–or, more specifically, the gel-like membrane that contains them. I chose plum tomatoes for my pizza because they tend to have far fewer seeds, which helped limit the moisture level from the start. However, to further reduce the water content, I just removed the seeds and membrane from the tomatoes. I did this by rinsing them off under running water–for which I’m sure some food purist will attack me–but I don’t think there’s any serious risk of lost flavor in doing this. There is, however, the risk of dropping a tomato into the nasty sink basin. Next, I set up a cooling rack over some paper towels. You could set a colander in the sink or put your cooling rack over the sink or a tea towel, too. I used paper towels here because for some reason there were no kitchen towels available and the sink was, well, kinda nasty. I know, I’m going to hell for killing trees. I’m a bad person. 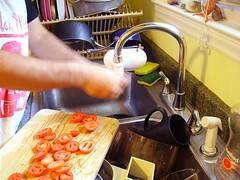 Anyway, the paper towels (or sink) are there to catch the moisture that will eventually be dripping from the tomatoes. 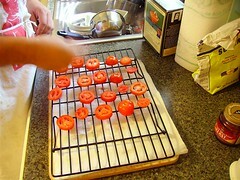 The next step was to sprinkle the tomatoes lightly with kosher salt. I would say I used maybe a teaspoon on each side of the tomatoes (for about three plum tomatoes sliced 1/4 inch thick)–bearing in mind that most of the salt actually fell through the grate of the cooling rack. It’s important to salt both sides of the tomatoes since, well, both sides of the tomato slices are wet. Now, I waited. As the tomatoes sit, the salt draws moisture out of the tomatoes. 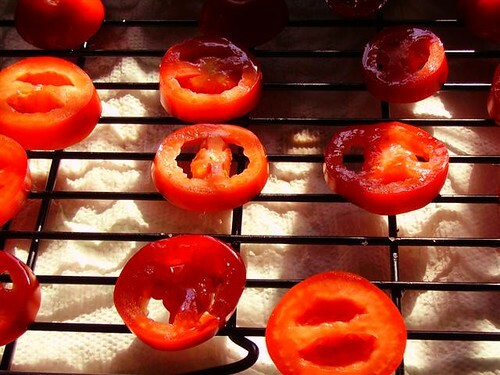 The moisture ends up on the surface of the tomatoes where it drips away onto the paper towels. (Using kosher salt rather than table salt helps keep the salt crystals intact while they do their thing, rather than getting washed away.) As part of the process, due to the magic of diffusion, some salt will get absorbed into the tomatoes as well, seasoning them nicely. And since diffusion is ultimately an entropic action, you can take solace in the fact that you’re contributing to the death of the universe by doing this. The entire process (of draining the tomatoes, not of driving the universe towards a state with no free energy) should take about one beer’s worth of time. Halfway through your beer, flip the tomatoes over so that both sides get adequate draining. When my tomatoes were done draining, I tasted one to make sure it wasn’t too salty–which it wasn’t, since I’d cut the tomatoes pretty thick. If you cut your tomatoes thinner, or if you use more salt to start with, they will absorb more salt. If that’s the case, you can rinse the tomatoes off at the end. (Be careful–it is possible to over-salt if you slice too thin or salt too heavily, in which case you’ll just have to choke down your salty tomatoes.) My tomatoes had a good salt level, so I just blotted mine dry on both sides with a paper towel to remove the remaining surface moisture. Now, my tomatoes were both well-seasoned and considerably less wet than they had been. This is how I avoided icky pools of water forming around each tomato when I grilled the pizzas. This technique is very useful for all sorts of situations: if you are sautéing zucchini, draining the vegetables first will help you get good color and also stop them from turning into mush as they cook. If you are grilling eggplant, the draining process actually helps to purge tannic compounds from the eggplant, which will help you avoid bitter baba ghannouj. You can also toss shredded cabbage with salt and set it into a colander to drain some moisture from it before you make a cabbage braise or a cole slaw, which will stop puddles from forming in the bottom of your bowl and will help to keep your cabbage crisp in the final dish. Experiment using this technique with other foods–cucumbers, tofu, slugs, bicycle parts… any time you find that you’re preparing something and it’s ending up just too wet, you may be able to improve the situation with a quick salting. Next > Experiment: Buffalo Gals, Won’t You Come Out Tonight? But seriously. It’s the exact same principle. a good cook always increases entropy. True. This is why I like to spend my spare time smashing the dishes. thank you!! there’s nothing worse than pools of tomato liquid on (an otherwise) perfectly grilled flatbread pizza! !